Bix Basement Systems is proud to hold an "A" Rating on Angie's List. Bix Basement Systems is proud to partner with P.A.W.S. animal shelter in Fort Madison, IA. The owner of Bix Basement Solutions Kevin Brown, even adopted "Duke" the shop dog from P.A.W.S. The Alzheimer's Association's mission is a world without Alzheimer's disease. Funds they raise from their walks help them to progress in the quest for prevention and cure for the disease. Bix Basement Systems is a proud sponsor of this Association. Bix Basement Systems has generously donated to Garretts Path. 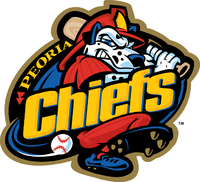 Peoria Chiefs are dedicated to being a leader in bettering the future and improving the community. The Chiefs are grateful to be a part of a community that supports us. We love to give back and be an active part of Peoria and the surrounding areas with appearances and donations. For more information on booking an appearance, requesting a donation, or would like to have the Chiefs at you next event contact the Community Relations Department at [email protected] or 309-680-4040 or click the link below. Every day, home owners are faced with a barrage of decisions. How do I ready my home for winter? What's the best mortgage for my financial situation? Should I remodel the kitchen? How can I spruce up and brighten my outdoor space? Now, the people who know the home best have a free e-newsletter for you. Subscribe to "NAHB Housekeys", developed by the National Association of Home Builders. "NAHB Housekeys" offers advice from national experts on building, remodeling and caring for your most important investment ... your home. Produced quarterly, the newsletter guides consumers through every stage of home ownership and the home building process. Inside each issue you will discover a wealth of essential home advice, directly from the experts. Straight to your in-box. The Peoria Rivermen have announced that season tickets are now available for pickup from the Rivermen office in the Peoria Civic Center. The Quad Cities Builders & Remodelers Association is a nonprofit association representing the new home and home improvement industries in Davenport, Bettendorf, Eldridge, Rock Island, Moline, East Moline... virtually the entire Eastern Iowa / Western Illinois area. The Quad Cities Builders & Remodelers Association in cooperation with the Home Builders Association of Iowa and the National Association of Home Builders works hard to find solutions for providing the public with quality, safe, affordable housing as well as generating funds to put back into our local communities. Members of the Association are from any company deriving business from the building & remodeling industries. They can range from trade contractors to designers, financial institutions to insurance companies, etc. Check the membership directory to see if the businesses you frequent are members! Bix Basement Systems is affiliated with the S.E. Iowa Builders Association. Bix Basement Systems has partnered with the United to help neighboring communities. The Peoria Area Chamber of Commerce is a membership organization of area businesses, delivering value to its members by cultivating a thriving business community, presenting the united voice of local business to government, offering continuously upgraded products and services for business enhancement and providing strategic business advisory services. The Peoria Area Chamber of Commerce’s Board of Directors approved a comprehensive strategic plan. The plan is designed to provide a roadmap for the Chamber’s ultimate goals of becoming the leading voice for business in the region. The plan’s guiding principles are outlined below. The Peoria Area Chamber of Commerce is the leading voice and resource for business in the region. The leading voice for business in the region through political advocacy. Inclusive and diverse in the approach to our work. An advocate to improve the quality of place in the region. A source for strong leadership development. Greater Burlington Iowa, a community of 28,000 located on the Mississippi River in Southeast Iowa, is a regional center for employment, shopping, education, healthcare and recreation. The community is beautifully situated on the bluffs of the river and has a rich heritage as a center of commerce and culture. The Greater Burlington Partnership has the wonderful opportunity to serve residents and businesses of this community, as well as the thousands of people who visit annually. This website is designed to be a resource to everyone who has the occasion to need information about what our organization and/or community have to offer. The East Peoria Chamber of Commerce is a strong network of more than 400 diverse businesses and nonprofit organizations. Founded in 1948 by local business leaders, the Chamber today is an independent organization that supports and advocates for enlightened economic growth in the greater East Peoria area. The McLean County Chamber of Commerce is a membership organization that serves nearly 1,000 businesses and organizations in McLean County and the surrounding area. Our full-time staff is passionate and dedicated to serving the business community and helping our membership thrive. The Quad Cities Chamber of Commerce is the community and economic development organization serving western Illinois and eastern Iowa. As the largest business organization in the region, we are committed to advancing the economic strength of our community. We're here to help you grow--whether you're a local business seeking to expand or one interested in relocating. We work with existing local companies to identify business needs, obstacles and opportunities, and connect them to the appropriate resources to meet their goals. In addition, the Chamber actively markets the Quad Cities region across the country, selling the benefits of doing business in our region. We have a great variety of businesses from retail to manufacturing, with strengths in defense, manufacturing and logistics, among others. While you're busy running your business, know that we are working on your behalf to grow the Quad Cities economy. The Quad Cities Chamber of Commerce is your go-to organization for all of your business resources. BBB helps people find and recommend businesses, brands, and charities they can trust. People today are overwhelmed with choices - and often unsure about where to find verified, unbiased information. There are more than 30 million businesses in North America alone; and hundreds of thousands of sites around the world where people shop online. There are thousands of free and subscription websites that offer a range of information, including reviews, reports, directories, listings, and gripe sites. BBB is the one place you can find it all. For over 100 years, BBB has helped people make smarter decisions and is evolving to meet fast changing marketplace needs. BBB sets standards for ethical business behavior and monitors compliance. Almost 400,000 Accredited Businesses meet and commit to our high standards. BBB helps consumers identify trustworthy businesses, and those that aren't, through more than 4 million BBB Business Reviews. BBB sets standards for and evaluates thousands of advertisements each year to ensure that people can trust what advertisers say. BBB sets standards for and evaluates the practices of thousands of charities so that donors know where their money is going. BBB coaches businesses on ethical behavior and how to build stronger, more trusting relationships with their customers. BBB offers its national and local consumer services online and in person. Through our efforts, BBB helps millions of people each year. The Council of Better Business Bureaus(CBBB) is the network hub for BBBs in the US and Canada. Like BBBs, CBBB is dedicated to fostering honest and responsive relationships between businesses and consumers -- instilling consumer confidence and advancing a trustworthy marketplace for all.